The Burlington High School Guidance Department will host our annual Freshmen and Sophomore Academic Planning Night on Tuesday March 5th at 6:00 in the Burlington High School auditorium. The topics covered will be important aspects of academic and post secondary planning, specifically geared for grades 9 and 10. We encourage parents and students to attend this event. If you cannot make the event it will be televised on BCAT. This year, please be advised that all available local scholarship paper copy applications can be downloaded directly from Naviance. The scholarship listing will be updated throughout the month of March as the scholarships are renewed by the local donors. A limited number of paper applications will also be available at the Guidance Office. Most applications have been posted. Each senior should check the scholarship link on Naviance AND Scholarship America on a weekly basis to ascertain if there are any new scholarships available. For each scholarship listed on Naviance, be sure to click on the link and read the details for more information on requirements, transcript requests, and directions on how to submit the scholarship application. You will note that some scholarship applications are turned in to the Guidance Office whereas others are mailed or submitted directly by the student. It is the responsibility of each senior to meet all specific scholarship deadlines. If you are having problems logging in please feel free to contact the Guidance office. Please listen to the morning announcements as Ms. Minty will hold several after school scholarship help sessions. As always feel free to schedule an appointment with your respective Guidance Counselor. The BHS Guidance Department cordially invites parents to join us for the next Guidance Breakfast. The topic will be about the"Course Selection Process. The breakfast will be held in the BHS Guidance Conference room at 9:00AM on Tuesday February 26, 2019. Please RSVP by calling 781-270-1780. We look forward to seeing you! The Burlington High School Guidance Department met with grades 9, 10 and 11 to discuss the course selection process and the 2019/2020 Program of Studies. Please click here to view the information presented to students. Also, on the right hand side of this blog, please find the box titled " Program of Studies" for information in regard to the program of studies and course planning. Most notably the Guidance Department has adopted a 4 year planner, which we recommend students consider completing as part of the course selection process. This year the Guidance Department added a new feature to our junior course selection meetings. 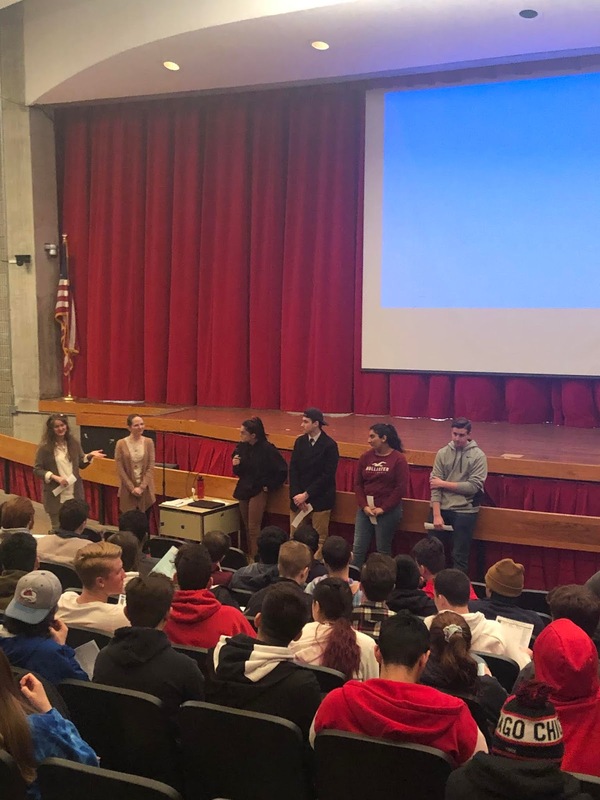 A group of seniors that just completed the college application process presented some key information to juniors in regard to the college application process. The seniors did a great job offering advice, tips and things to avoid. Our hope is this presentation serves as a great segue as the BHS Guidance Department dives into the colleges process with juniors. Junior parents and students are reminded that Junior College Planning Night will be held Wednesday February 6th,2019. The evening will commence at 6:00 PM in the Burlington High School Auditorium. Members of the Guidance Department will cover a variety of topics in regard to academic and college planning. This presentation is geared specifically for junior students and parents. If you cannot make the event it will be televised on BCAT. The times will be posted at a later date. For parents of Freshmen and Sophomores, the BHS Guidance Department will host Freshman/Sophomore Academic Planning Night on March 5th at 6:00.